Mickey gets ready to open the store! 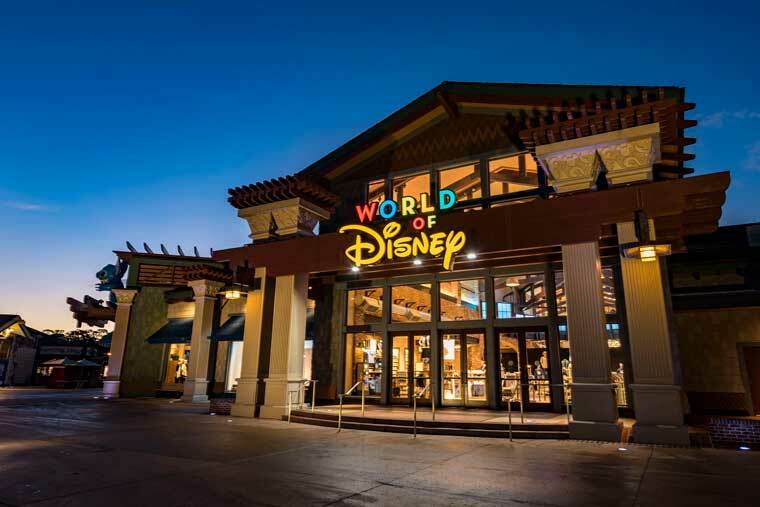 On Friday the Walt Disney Company and Hanes officially opened “Disney Design-a-Tee presented by Hanes”, an innovative next-generation store for apparel souvenirs at Downtown Disney in the Walt Disney World Resort. 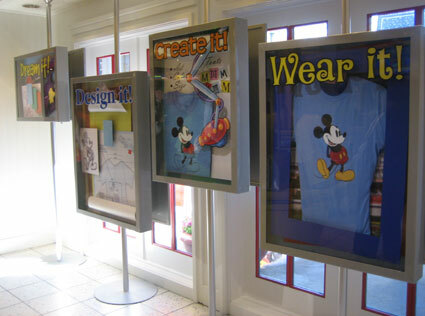 The first-of-its-kind interactive T-shirt design and printing store enables Disney guests to enhance their magical Disney experience with a personalized custom-designed Hanes T-shirt printed while they wait that is as easy to buy as souvenir apparel off the rack. And much more fun! Really well prepared cake made to look like a stack of t-shirts for the celebration. This was also the pin design for the grand opening event. Guests at Disney Design-a-Tee presented by Hanes, which is located in Downtown Disney, use touch-screen kiosks for an interactive experience to design their custom shirts, selecting long-sleeve or short-sleeve T-shirts, choosing from multiple colors, picking artwork from more than 100 selections featuring Disney animation and movie characters, and crafting their own text message using a wide selection of type fonts and colors. The design possibilities are infinite, and the shirts are printed on site while guests wait using premium environmentally friendly water-based ink. Art selections include multiple designs featuring not only famous characters such as Mickey and Minnie Mouse, Snow White and others from classic Disney films, but also characters such as Crush from Finding Nemo, Princess Belle from Beauty and the Beast, and Tow Mater from Cars. Door prize given away to first guests to shop in the store. 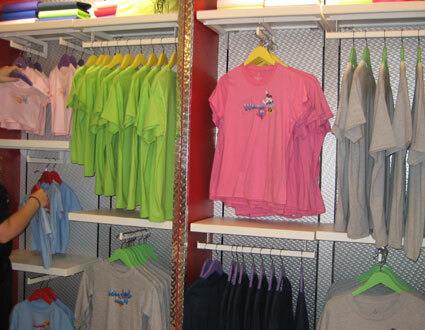 The store is cleverly designed and features the brand of Disney Magic you expect is required to make this more than just a t-shirt store. Younger children will especially love the interactive process that’s involved with designing and then making the shirt. decor shows guests the process for designing their own t-shirts. So what differentiates this store from online stores like Zazzle, which has a Disney branded shop, where you can choose from many more designs and characters? Well, for one, you can actually hold and try on an exactly same sized shirt at the store. You don’t have to pay for delivery either. The Design-A-Tee store makes your shirt the same day you order it. If you’re there early in the morning you could have it in as little as 15 minutes. For those who come when the store is busier it may take quite a bit longer. Those staying at a Disney resort should take advantage of free delivery to their room. You can also return the next day to pick it up. sample t-shirts available to judge size and quality. 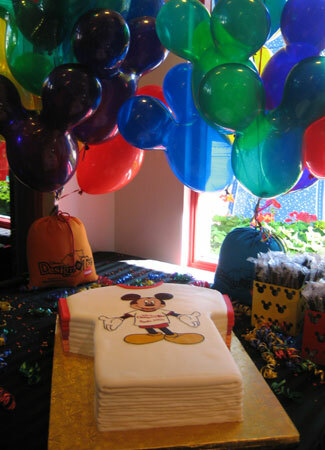 The grand opening event was attended by guests who were treated to a festive decor, confetti cannons, a giant T-shirt cake and a visit from Disney’s most famous star, Mickey Mouse. Kevin Lansberry, vice president, Downtown Disney operations, and Falken spoke at the event and invited guests to try their hand at designing their own special T-shirts. 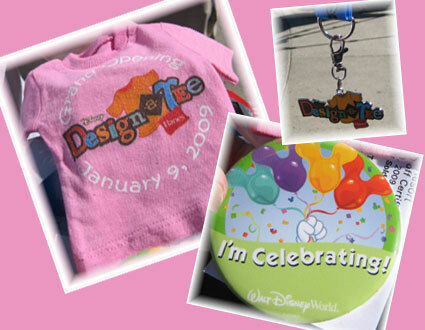 Disney Design-a-Tee uses a unique application of state-of-the-art technology and printing equipment in a process designed by Hanesbrands’ research and development team. This is the first application of printing technology that allows consumers to walk up, design and print a custom message on a T-shirt of any color with screen-print quality. 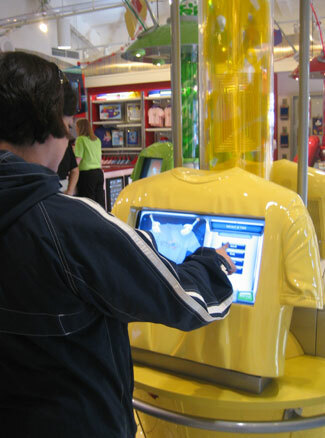 Building your t-shirt on a t-shirt shaped kiosk. Clever. T-shirts are available in a wide variety of colors and styles, including long and short sleeve versions, and come in infant, toddler, youth and adult sizes. Prices range from $18 to $31. The company expects to add additional apparel product offerings at a later date at the store. 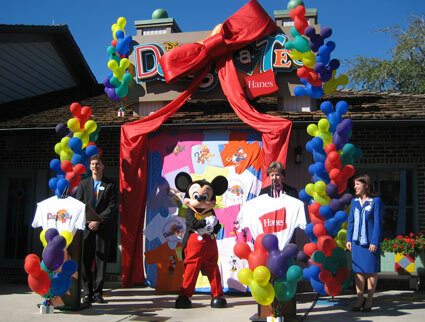 Disney Design-a-Tee is open every day from 9:30 a.m. to 11 p.m. and is located at 1790 East Buena Vista Drive. 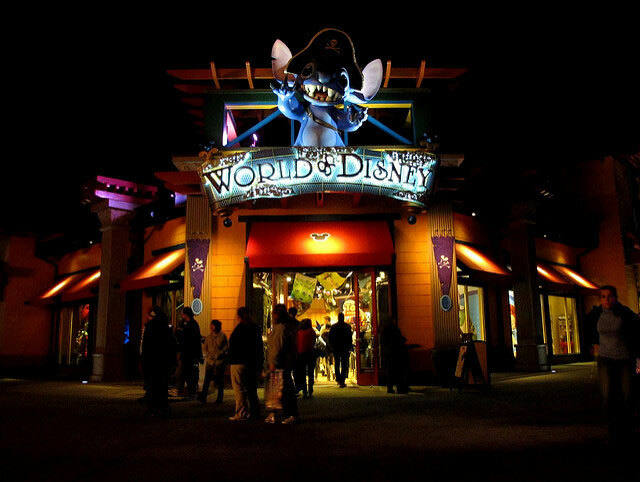 Downtown Disney is open to the general public and resort guests and is accessible by car and by the Walt Disney World Resort guest shuttle system.